I had the opportunity to speak at Tech O Rama in Mechelen, Belgium last week. It was my first trip to continental Europe. Belgium is a wonderful country, and I’m very impressed with the conference that Gill, Pieter, Kevin, and the other volunteers put together. My talks were on C# 7, and using the Roslyn APIs. Those talks were both updates form my NDC talks. The repositories contain the updated presentations and code. I also substituted for Martin Woodward, giving his talk on the .NET Foundation. And appearing in an upcoming .NET Rocks show discussing Open Source. The C# 7 story has moved forward since I spoke at NDC London. There’s now preview bits. (Preview 2 came out this week). Using that build, you can try out three of the upcoming C# 7 features: Nested Local Functions, Pattern Matching, and Ref Returns. The release notes explain how to turn on each of these language features. Some of the other features initially discussed may not be in the next release (but may make a later release). Note: pay careful attention to ‘may’ as the verb. Watch the team’s announcements on GitHub for the official announcements. Preview 2 also contains updates to the Analyzer SDK. These updates make it simpler to create analyzers that focus only on code semantics (as opposed to syntax models). I haven’t updated my NDC and Tech O Rama samples for that model yet, but I will. I would recommend any of my readers that can should try and attend Tech O Rama. It’s a wonderful conference in a great location. The recent events made travel a bit of a challenge, but people in Belgium responded and made it as safe and convenient as possible. I’ve been self-employed for quite some time. I’ve started three companies, including building one of them into a 2 time Inc. 5000 awardee. I’ve enjoyed all the time as an independent consultant, entrepreneur, and business owner. At my core, though, I love software. I enjoy building software. I enjoy helping other developers learn new tools, and new skills. Since selling SRT Solutions, I’ve spent my time teaching developers to use .NET and C#. I’ve been teaching classes for corporate clients, bootcamps for people just learning to develop software, speaking at seminars and at conferences. That’s been great fun. It’s also been somewhat limiting. There’s only so many people I can reach as an independent consultant. So it’s time to continue this mission as part of a larger organization. This last week, I accepted a full time position with Microsoft on the .NET Core content team. I’ll be part of a team building learning resources for developers that are new to the .NET Core platform. One audience is experienced .NET developers that want to learn what’s different as they start working with .NET core. Another important audience is developers that are experienced with other platforms and want to investigate .NET Core. One key reason why I accepted this position is the exciting future for the .NET platform. Running on Linux, MacOS, Android and iOS opens many new possibilities for the platform, the languages, and the framework. Seeing the rapid pace of innovation in the C# language now that the team is building on the Roslyn platform is equally exciting. I’m glad that I’ll now have a role as part of the team responsible for helping developers use these tools. Equally important is the respect I have for the team members. Both the engineering team and the content team are filled with awesome, smart people. I’ve worked with many of them as an MVP and RD over the past several years, and I’ve got immense respect for the people that will be my co workers. The final motivator is to continue creating content for all the different styles of learning that exist. Some people enjoy reading, some enjoy watching video based content, others want guided labs to help them explore. I’m excited that the .NET Core content team is exploring all of these ideas, and more different ways to help developers learn the platform, the libraries, and the languages. I’m excited to work with a much larger audience to learn more about .NET and C#. It’s going to be fun. I’m thrilled to have been nominated and accepted as a member of the .NET Foundation Advisory Board. 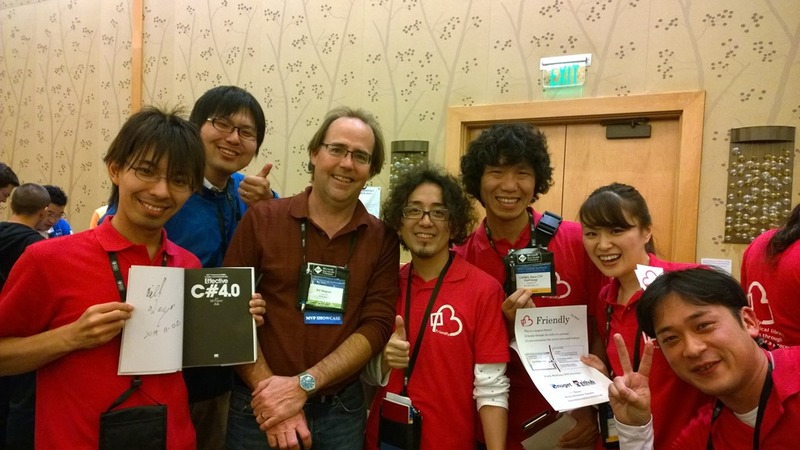 I’m very excited about the role we can play in growing the Open Source ecosystem around .NET. We’ve just gotten started, so there is not a lot of progress to report, but I’m excited by the potential. Our role is to provide a channel between the .NET Foundation Board of Directors and the .NET developer community. We will be helping to refine policies to accept new projects, grow and nurture the projects under the .NET Foundation, and overall, make .NET Open Source Development better and richer for everyone. Shaun Walker is the chairman of the .NET Foundation Advisory Board, and his announcement here is a great description of the rationale and thought process that went into creating the advisory board. I’m excited to participate in growing Open Source development around .NET and the great languages and frameworks that are coming from the developer teams. This is a large and important initiative. It covers everything from the Roslyn compiler projects, to the TypeScript compiler to ASP.NET vNext to the Core CLR and core .NET Framework releases. And that’s just the major projects from inside Microsoft. There are so many tremendous projects (like ScriptCS, just to name one) that are part of a growing .NET ecosystem. We’ve got quite a bit of work to do. The Foundation is a new organization, and we need to advise the board on everything from what kinds of projects we’ll accept, to the process for accepting new projects, to the governance of the advisory board. It’s a lot of work, but it’s also a lot of fun. It’s an exciting time to be a .NET developer. I’m glad to be in the middle of it. I’m glad that I was selected to speak at self.conference, coming to Detroit this May. The speakers and sessions are a strong mix of the technical community in this area. In addition to quite a few local speakers, other super smart folks from the midwest are apeaking. I also want to point out Tony Surma’s talk on “Apps that work when nothing else does.” Tony is a fellow board member for Humanitarian Toolbox, a charitable organization that creates Open Source applications for disaster relief. I’m the president and a board member as well. We’d love to have your help developing these applications. And, as you’ll learn from Tony’s talk, there’s a lot of software product skills you’ll learn developing apps that have to run in a disaster zone. Self.Conference promises to be a great, great event. Go to http://selfconference.org/ and register today. See you in May. Today, I’m formally launching my new venture to help companies grow and retain software talent. I’ve spent the last 15 years growing the talent pool at SRT Solutions, the firm I sold last August. I know first hand the challenge of hiring and retaining software developers. I also know the investment needed to grow talent, and ensure that developers always have the skills that are needed for modern application development. The classes I’ve developed are on the same topics where I mentored the great developers at SRT Solutions: C#, LINQ, ASP.NET web development, and Lean Development Practices. The material leverages successful talks and seminars I’ve given at national and international conferences. And, of course, some of the material comes from my Effective C# books. You can see the full list, and the current course catalog here. I’m limiting the class size to 20 people so that I can spend enough time with each attendee throughout the course. I’m also teaching all the courses myself. I’m not licensing the material to others, or hiring other instructors. Every class will be taught by me personally. If your organization could benefit, please let me know. This coming Saturday, October 19th, I’ll be at Boston Code Camp 20. I’ve got two talks: Practical LINQ in the morning, and The Task Asynchronous Programming Model in the late afternoon. This will be the first time I’ve spoken at the Boston Code Camp, and I’m looking forward to meeting developers in the New England community. I’m spending more time on the East Coast now and I’d like to become more involved with that community. Between my sessions, I’ll be splitting time between web sessions and Windows 8 sessions. There’s a great set of content on both topics, and it will be a good chance for me to pick up some knowledge on both of these areas.